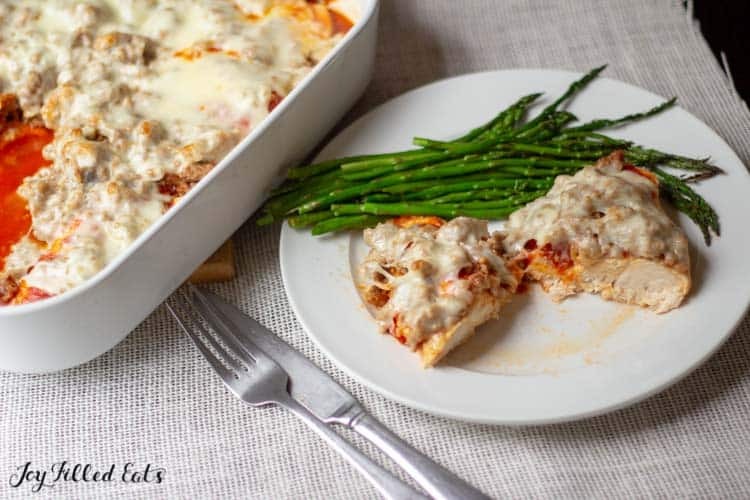 This Italian Baked Chicken with Sausage only takes 35 minutes from prep to table! For a weeknight dinner with only 5 ingredients, it is impressive. Throw a veggie on the plate and dinner is served. This recipe was born one night when it was 5:30 and I had no idea what I was going to make for dinner. I turned on the oven and started pan searing chicken. And then I just winged it. We had already had chicken a few nights that week so I needed to dress it up a bit. I decided to smother it with sausage, tomato sauce, and provolone cheese. I got this on the table from start to finish in 35 minutes! I even impressed myself. My husband is a meat guy. Most nights I have to remind him to serve himself some of the vegetables too. 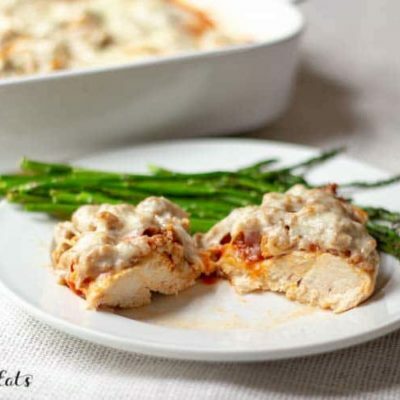 He loved this easy Italian chicken dinner. He is also Italian so anything with tomato sauce or sausage normally gets a big thumbs up. If it has both sauce and sausage it gets two thumbs up. I served this with roasted asparagus. I just trim it, drizzle it with a little olive oil and sea salt, and put in a preheated 400-degree oven on a cookie sheet until tender. You could also serve it with homemade Caesar salad, Garlic Broccoli, steamed green beans, or with zucchini noodles. 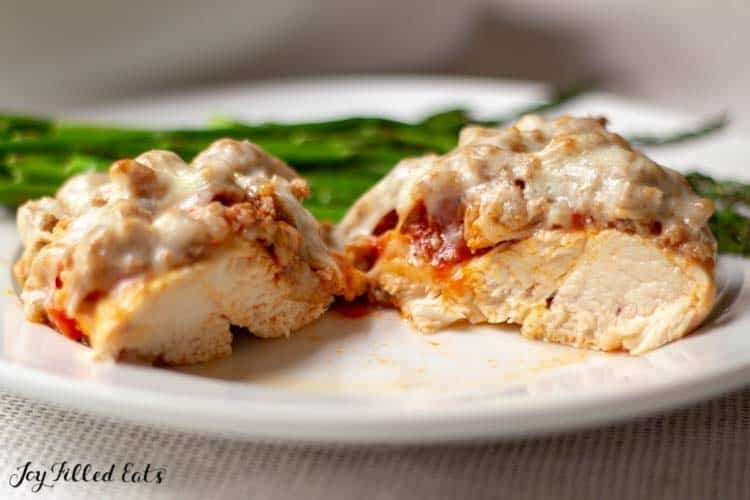 Here are some of our other favorite Low Carb Italian Recipes! 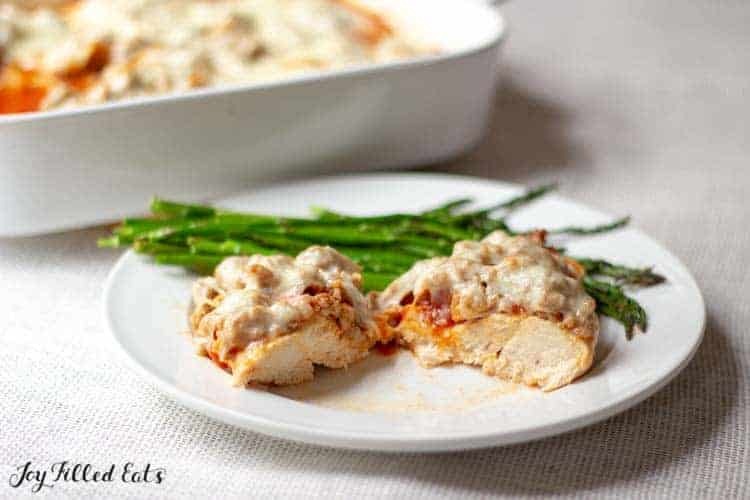 This Italian Baked Chicken only takes 35 minutes! For a weeknight dinner with only 5 ingredients, it is impressive. 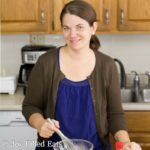 Low Carb, Keto, THM S, Gluten-Free. Preheat the oven to 400. Sprinkle the chicken with the garlic salt. Spray a large frying pan with cooking spray. Brown the chicken over medium high heat. (I did it in two batches). Transfer to a baking dish and put in the oven. Bake for 10 minutes. Meanwhile, in the same frying pan cook the sausage until golden. Break it up into small pieces using a potato masher or spatula. 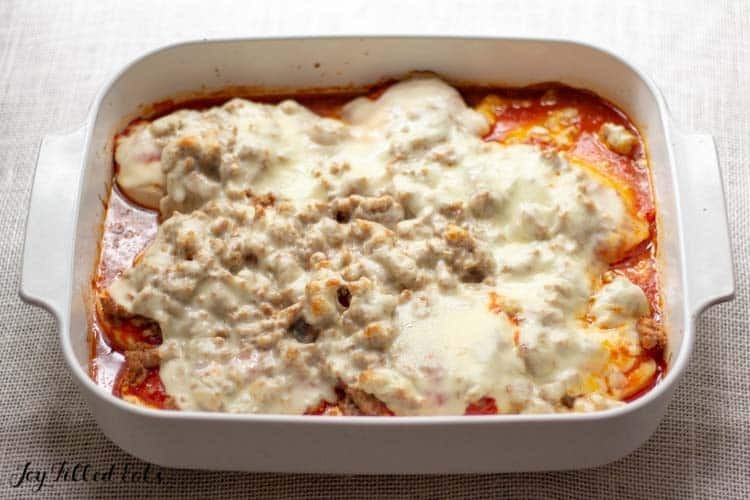 Remove the par-cooked chicken from the oven and top with the tomato sauce and then the sausage crumbles. Bake for 10 minutes. Top with the slices of cheese. Bake for an additional 5-10 minutes until the chicken is 160 on a meat thermometer. Originally Published June 7, 2016. Revised and Republished March 16, 2019. Thank you for this recipe, Taryn! It was a hit at my house tonight. I had all the ingredients in the fridge! We made this tonight and it was SO good! I added some Italian Seasoning to the sauce, but otherwise followed it exactly! Where's the garlic come in? You sprinkle the garlic salt on the chicken before cooking it. Did you use Italian sausage? I'm new to THM - so is this an S or E meal? Thx! when trying to print the recipe, it comes up blank. The picture is there but the written words of the recipe are not. I'm not sure why that's happening. I just checked on my phone and the words are there. Are you desktop or mobile? This looks really good! Can't wait to try it!